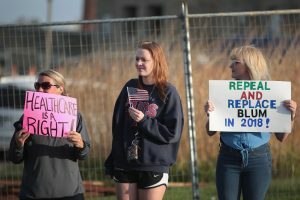 It’s turning into a pattern: House lawmakers return to their districts during their congressional recess for a week or two of constituent outreach, and progressive activists show up to their town halls to protest Republicans’ plans for a health care overhaul. The opposition ramped up again during the House recess this week just days after the House GOP passed its health care bill on a 217-213 vote making for yet another round of awkward town halls for House GOP members. The vote, without support from a single Democrat, set the stage for a lengthy fight over health care policy that will help define the 2018 midterm elections. 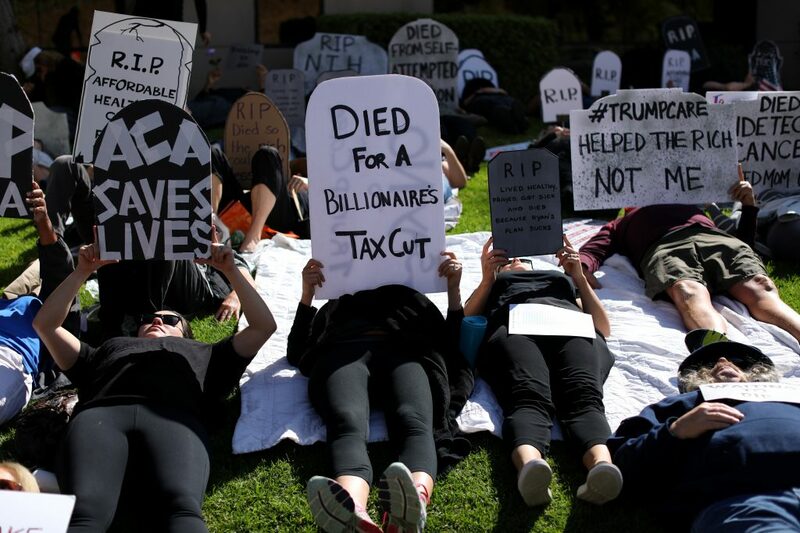 Critics on the left are using personal health care stories to protest the bill — including a series of “die-ins” in front of district offices — while organizations like Swing Left are raising money for Democratic candidates in congressional districts represented by Republicans who voted for the bill. Money from opponents of the bill is pouring into liberal organizations. Swing Left, the liberal website Daily Kos and the fundraising platform ActBlue raised more than $2 million combined in the 24 hours after the bill passed the House. By Monday, Swing Left alone had raised more than $1.3 million from 30,000 donors. “Thankfully, the overwhelming response we’ve seen from countless Americans ensures that many House Republicans will quickly regret their vote,” Todras-Whitehill said in a statement. Some Democratic lawmakers are also getting in on the action. Rep. Ruben Gallego, D-Ariz., is slated to join a rally in Republican Rep. Martha McSally’s Arizona district on Tuesday protesting her support of the bill. While the House vote fulfilled a years-long GOP promise to gut the Affordable Care Act, it could hurt GOP lawmakers in 2018. After the vote, the Cook Political Report upgraded Democrat’s chances in 20 Republican-held House seats. Democrats lost 63 House seats in the 2010 midterms, after the party pushed the Affordable Care Act through Congress. The party has struggled to regain seats in the House since then. During a town hall meeting Monday, Rep. Ron Blum, R-Iowa, faced backlash from his constituents for voting for the House bill. The two-term congressman is a member of the House Freedom Caucus; he represents a district that voted for former President Barack Obama in 2012 but went for President Donald Trump in 2016. Protesters outside a town hall for Rep. Elise Stefanik, R-N.Y., who also voted for the bill, chanted “shame, shame, shame” as she addressed constituents Monday night. Time will tell if the recess-week protests have an impact on the health care fight, which now moves to the Senate. But there are some signs that lawmakers are taking notice. Several Republican senators have expressed reservations about the House bill. At a town hall in February, a 25-year-old woman told Sen. Tom Cotton, R-Ark., that the Affordable Care Act allows her to access life-saving medical care despite having a preexisting condition. After hearing her story, Cotton — part of a group of 13 GOP senators working on the upper chamber’s version of the bill — said he would not support a bill that would allow insurers to discriminate based on pre-existing conditions.